Auto maker BMW's venture fund BMW i Ventures has invested $5 million in MyCityWay, a New York based company offering a location-aware app for mobiles. This startup was founded in 2009 by three Indian NRIs - Archana Patchirajan, Sonpreet Bhatia and Puneet Mehta. The stake acquired by BMW is not known. While both Patchirajan and Mehta were employed at Citigroup before founding MyCityway (Patchirajan was a senior consultant and Mehta was Senior Vice President with Citigroup), Bhatia was the Vice President with Merrill Lynch / Bank Of America. In May, 2010, MyCityWay raised $1 million in seed funding from FirstMark Capital, which has $2 billion in capital commitments; early stage fund IA Ventures whose current investments include CrowdSpot, FluidInfo, Metamarkets, TraceVector, Recorded Future and The Trade Desk; and NYCEDC, which is a New York City fund for economic development. According to the BMW corporate website, executive Ian Robertson said, "We have just signed our first strategic partnership with My City Way. As a mobile app, My City Way provides users with information on public transportation, parking availability, and local entertainment for over 40 cities in the US. Another 40 cities will be part of the global rollout, including Munich, of course." BMW Group's interest in MyCityWay stems from its aim to make capital investments in mobility service providers. BMW-i will focus on sustainable vehicles and bringing mobility solutions to driving. BMW, which manufacturs the BMW, MBW MINI and Rolls-Royce range of cars, is also attempting to integrate iPhone applications for its cars using BMW ConnectedDrive, which will be available this month for 150 pounds. Called BMW Connected app, it will allow drivers to listen to web radio, send and receive Facebook and Twitter posts all from the dashboard. MyCityWay offers a suite of apps and an app platform that are based on location based services, allowing users to search for, discover and find a route to the nearest landmarks, hotels, etc. You can also buy tickets for a movie, check the weather or classied ads for an apartment, as well as see live traffic feeds on the mobile, making it an mega-app that combines all location based services on a single mobile platform. In fact, the company claims it is 50 apps rolled into one. Users can also share information through the app which is integrated with various social networks such as Facebook, Twitter and Foursquare. The apps are available for only few devices right now - the iPhone, iPad, Blackberry and Android based phones. It is yet to launch on the web and on other handsets. 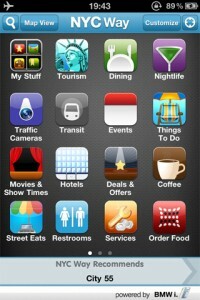 MyCityWay launched its first app for its hometown - called NYC Way - in December 2009 and then developed apps for Boston, San Francisco, Los Angeles, Washington DC, Las Vegas and London and is now present in 40 cities in US. It is now rolling out globally in 40 cities and has already launched in Shanghai, Tokyo, London and Paris as well as in Canada - in Toronto, Montreal and Vancouver.